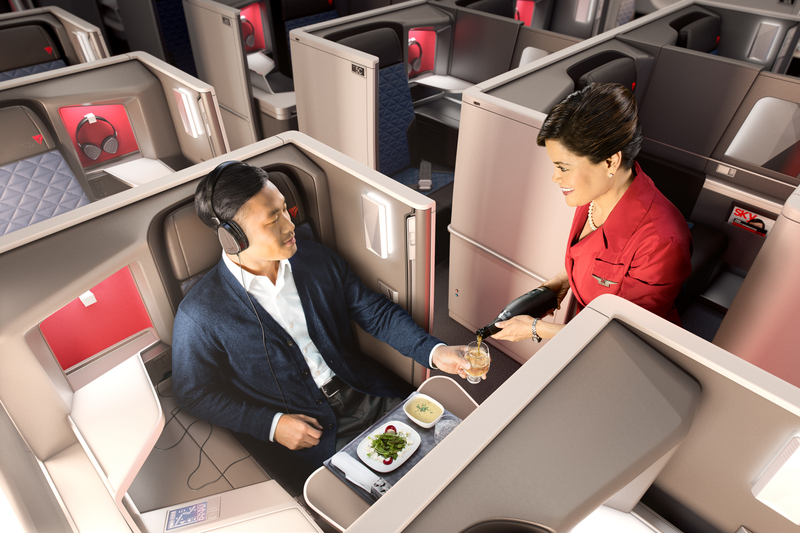 Delta began selling its Delta One suites and Delta Premium Select fare on June 17. The new Delta Premium Select cabin and the Delta One suite product enhancement will debut on Delta’s first Airbus A350, due to enter service in fall 2017 with its first flight taking place on Oct. 30, 2017, from Detroit (DTW) to Narita (NRT). Delta will be the first U.S. airline to take delivery of the A350, which provides better fuel efficiency and customer-friendly features designed to improve the flying experience. These enhancements are part of the airline’s multi-billion dollar investment in the customer experience that includes a cabin modernization program featuring new seats, seatback entertainment systems with free entertainment, high-capacity overhead bins, access to Wi-Fi on nearly all flights, free Main Cabin meals on select flights, upgraded free Main Cabin snacks, chef-curated meals in Delta One, a seasonal wine program, an Alessi-designed collection of serviceware in Delta One and First Class, and more. Delta One service also includes the features Delta customers have grown to expect, such as chef-curated meals, wine pairings by Delta’s Master Sommelier Andrea Robinson, Westin Heavenly In-Flight Bedding, noise-canceling LSTN headphones, TUMI amenity kits featuring Kiehl’s Since 1851 premium skincare, and in-flight loungewear on select flights. Sky Priority service, which includes faster check-in, accelerated security, premium boarding and expedited baggage service. In 2014, Delta began introducing differentiated experiences for customers through a well-defined range of options, allowing customers to tailor travel to their specific needs. All cabin experiences offer a high level of service and Delta’s unmatched operational reliability. The long-range Airbus A350 will continue Delta's optimization of its Pacific network, operating primarily on long-range routes between the U.S. and Asia. The jets are expected to generate a 20 percent improvement in operating cost per seat compared to the Boeing 747-400 aircraft they will replace. Following the A350 debut, the Delta One suite will progressively roll out on Delta’s Boeing 777 fleet.